← Football/Soccer on the Temple Mount (Haram esh–Sharif)? On one of our visits to the area of Corinth we had a chance to explore a seldom-visited portion of the ancient diolkos that is located on the isthmus that connects the Greek mainland with the Peloponnese. 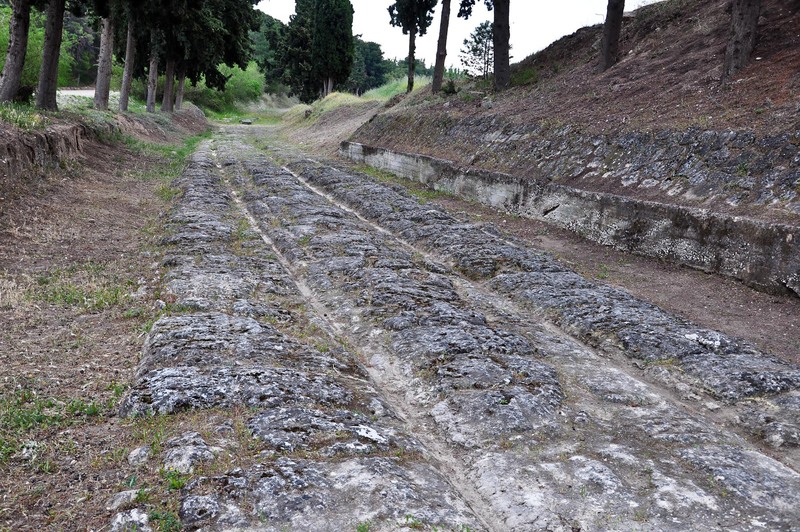 This portion has been excavated and is very well preserved. 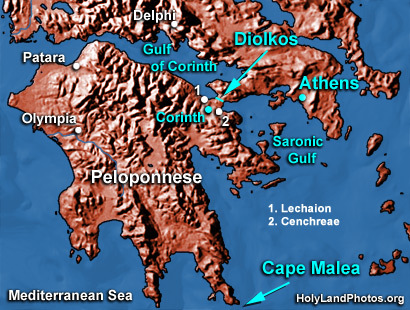 The Diolkos [Greek meaning “haul across”] was a paved “road” that connected the Corinthian and Saronic Gulfs before the Corinthian Canal was dug. It was built because sailing around the southern tip of the Peloponnese was very treacherous. Strabo, for example, writes ‘But when you sail around Cape Malea, forget your home” (= “you’ll never return!”; viii 6, 20). The ancients offloaded their cargo, dragged it on wheeled carts across the isthmus from one gulf to the other to the other side of the isthmus, and then loaded it on to another ship. Small to medium size ships could be transported from gulf to gulf by this method also. 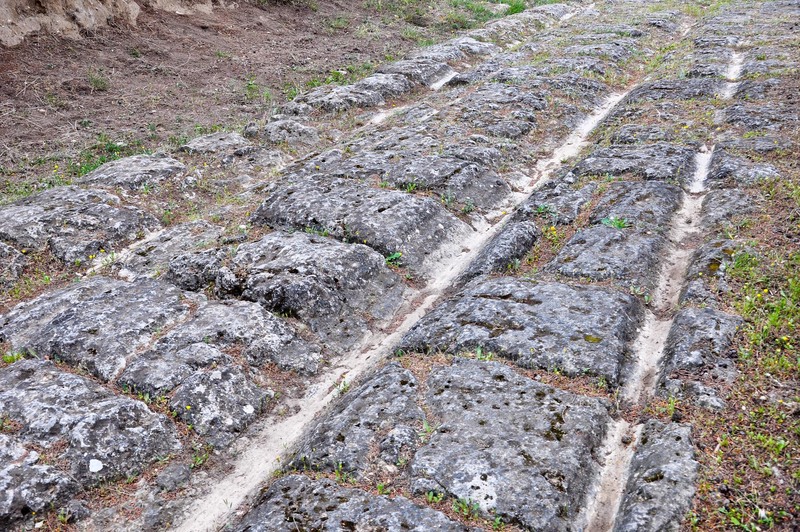 Detail of the Tracks/Ruts that guided the path of the wheels of the vehicles that carried ships and cargo from one gulf to another. The Diolkos was constructed during the sixth century B.C. and was in use for over 1,000 years! It was made of large paving stones and was about 11 to 20 ft. [3.4 to 6 m.] wide. It followed a circuitous route, avoiding high ground if possible, from one side of the isthmus to another. To view additional photos of the diolkos plus additional commentary and a detailed map of its route — Click Here. This entry was posted in Places in Greece and tagged Canal, Corinth, Diolkos, Isthmus. Bookmark the permalink.